Stephen and I have found through our research on the 263 men who were recruited on the 1915 Gilgandra to Sydney Coo-ee March, that 41 of them died while on active service overseas during WWI. Stephen and I visited the graves of the fallen Coo-ees in France, Belgium and England in 2012, 2014, and 2016. 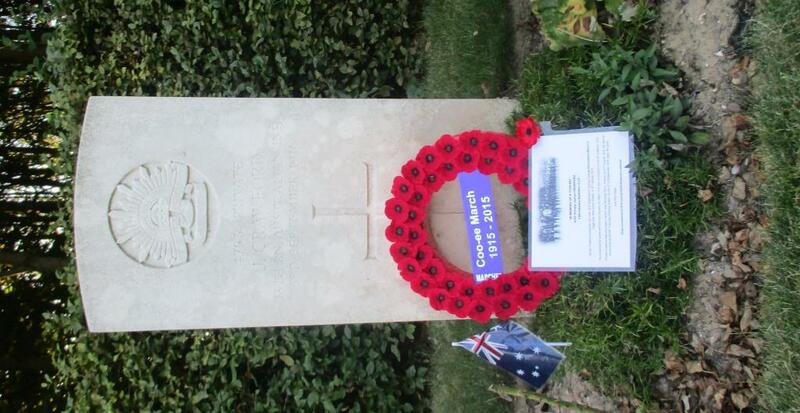 During our 2016 visit we took a travelling wreath to rest on each of their graves. 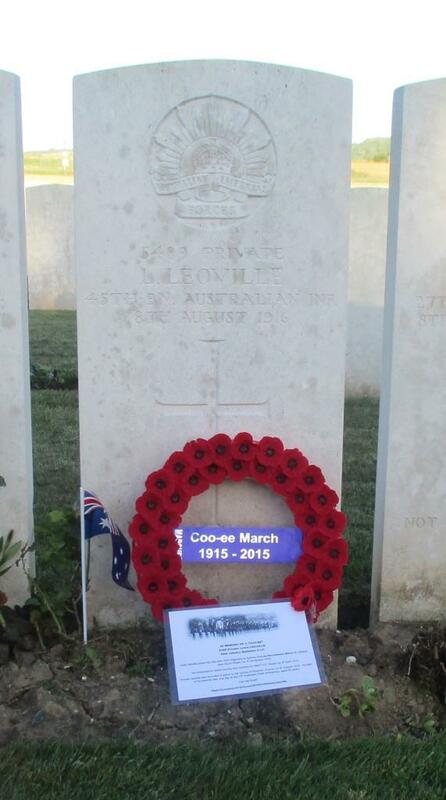 The Coo-ee March 2015 Inc. (Gilgandra Sub-Committee) provided the purple Coo-ee “badge” ribbon that we placed on our wreath, which had been created to be worn by the marchers during the 2015 Coo-ee March Re-enactment in memory of the purple “badges” worn by the original Coo-ees during the 1915 Coo-ee March. 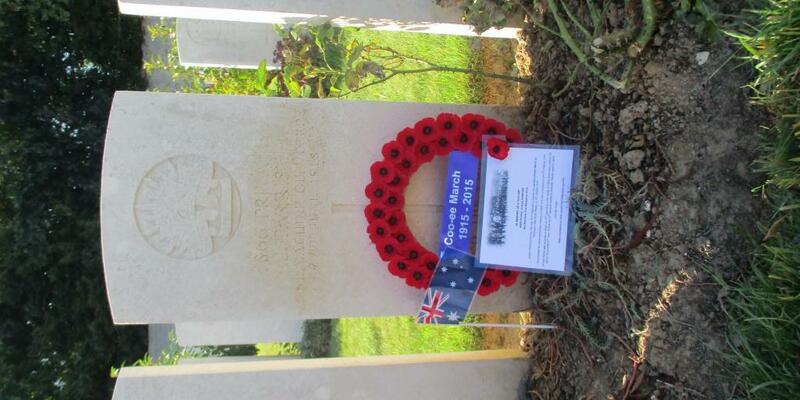 We left an Australian flag and a commemorative information card on each of their graves. Harold Baxter was born at Illford, Essex, England. He gave his age as 22 years and 4 months (though he was actually only 18 years and 4 months at the time), his marital status as single, and his occupation as a farm labourer, when he enlisted. He joined the Coo-ee March at Gilgandra. He was attested at Gilgandra on 9th October 1915, and completed his medical examination on the 10th October 1915 at Gilgandra. He embarked for active service from Sydney on HMAT A15 Star of England on 8th March 1916, with the 15th reinforcements for the 13th Battalion. He was transferred to the 45th Battalion in Egypt on 19th April 1916. 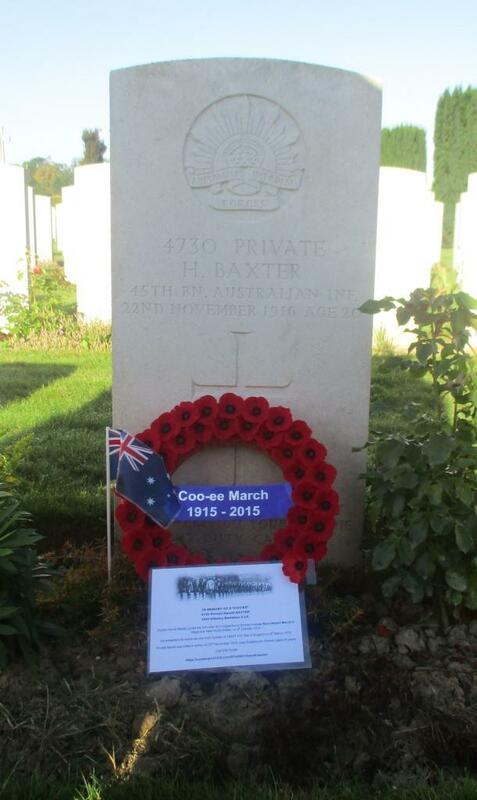 Private Baxter was killed in action on 22nd November 1916, near Guedecourt, France. His age at death is listed at 20 years on his headstone, but he was only 19 year and 6 months of age when de died. He was buried at the Bancourt British Cemetery, at Bancourt, France. Charles William Gordon Conroy was born at Thames, New Zealand. He gave his age as 41 years and 6 months, his marital status as married, and his occupation as chemist, when he enlisted. He joined the Coo-ee March at Orange. He was attested, and completed his medical examination, at Orange on 25th October 1915. He embarked for active service from Sydney on HMAT A70 Ballarat on 16th February 1916, with the 14th reinforcements for the 13th Battalion. He was transferred to the 54th Australian Infantry Battalion in Egypt on 1st April 1916. 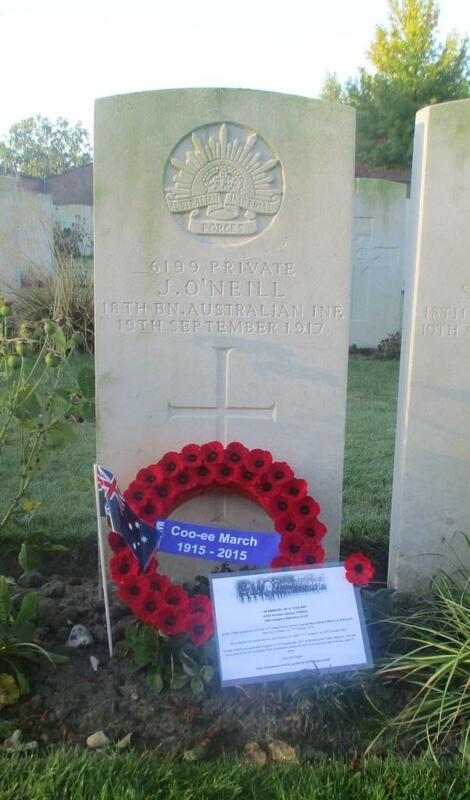 Private Conroy was killed in action on 19th/20th July 1916, during the Battle of Fromelles, aged 42 years. He has no known grave. His name is remembered on Panel 10 at the V.C. Corner Australian Cemetery and Memorial at Fromelles, France. Bernard Coyte was born at Borenore, N.S.W. He gave his age as 21 years and 1 month, his marital status as single, and his occupation as farmer & labourer when he enlisted. He completed his medical examination and was attested at Orange on 14th October 1915. He joined the Coo-ee March when the Coo-ees arrived at Orange on 23rd October 1915. He embarked for active service from Sydney on HMAT A15 Star of England on 8th March 1916, with the 15th reinforcements for the 13th Battalion. Private Coyte was killed in action on 18th September 1918, in the vicinity of Le Verguier, France, aged 24 years. 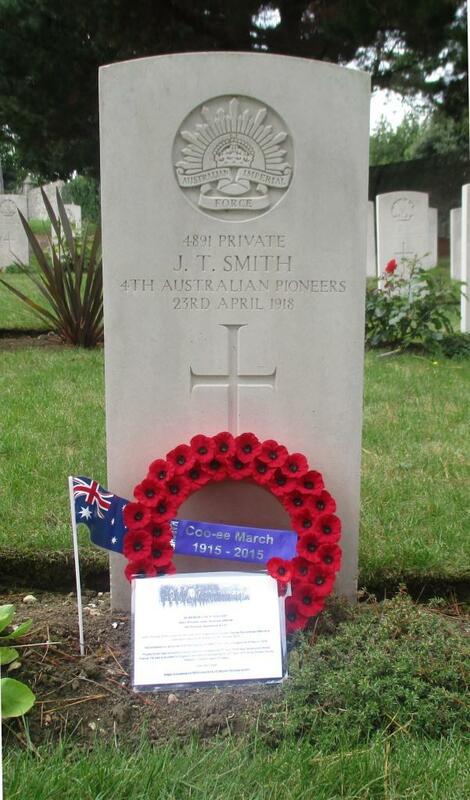 He was buried at the Jeancourt Communal Cemetery Extension at Jeancourt, France. James Crawford was born in Glasgow, Scotland. He gave his age as 38 years, his marital status as single, and his occupation as farmer, when he enlisted. He joined the Coo-ee March at Gilgandra. He completed his medical on 8th October 1915 at Gilgandra, and was attested on 9th October 1915 at Gilgandra. Private Crawford was wounded in action near Mouquet Farm, France, on 31st August 1916. He died of his wounds at the 49th Casualty Clearing Station on 3rd September 1916, aged 46 years. 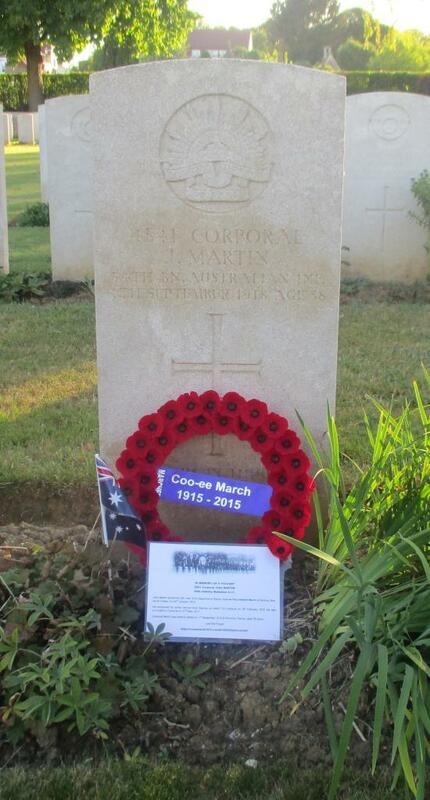 He was buried at the Contay British Cemetery at Contay, France. Harry Davenport (aka Harry Swendson) stated on his Attestation Paper that he was born in Toronto, Canada ( but he was actually born at Hawthorn, Atchison County, Kansas). He gave his age as 41 years (though he appears to have been several years younger), his marital status as widower, and his occupation as billiard table proprietor, when he enlisted. He was on of the men who stepped forward and gave his name when the Coo-ees recruited in Wongarbon on 14th October 1915. He joined the Coo-ee March at Orange. He completed his medical examination, and was attested at Orange on 24th October 1915. After attending the A.I.F. Officer Training School at Duntroon, Second Lieutenant Davenport embarked for active service from Sydney on SS Port Nicholson on 8th November 1916, as part of the 22nd reinforcement for the 4th Infantry Battalion. He was promoted to Lieutenant on 16th July 1917. Lieutenant Davenport was wounded in action on 4th October 1917, at Broodseinde Ridge, Belgium. He died of his wounds that same day, aged 35 years. He was buried at Broodenside Ridge, however his grave marker was destroyed in further fighting. He has no known grave. His name is remembered on the Menin Gate Memorial at Ieper (Ypres), Belgium. Harold Brooks Davis was born at Parramatta, N.S.W. He gave his age as 18 years (although he was actually only 14 years and 8 months old at this time), his marital status as single, and his occupation as plumber, when he enlisted. He joined the Coo-ee March in the Blue Mountains on 8th November 1915. He completed his medical examination and was attested at Ashfield on 11th November 1915. He was the youngest of the Coo-ees to enlist. 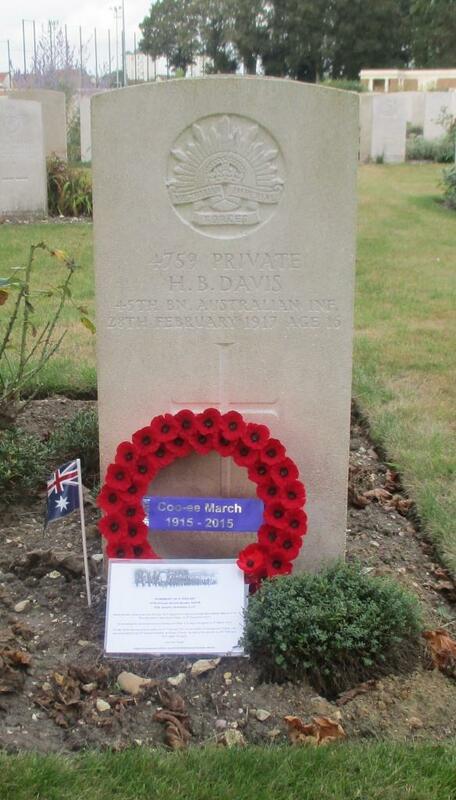 Private Davis was wounded in action on 21st February 1917 in the vicinity of Guedecourt, France. He was evacuated to the 6th General Hospital, at Rouen, France. He died of his wounds on 28th February 1917, the day before his 16th birthday. His age is recorded as 16 years on his headstone. He was buried at St. 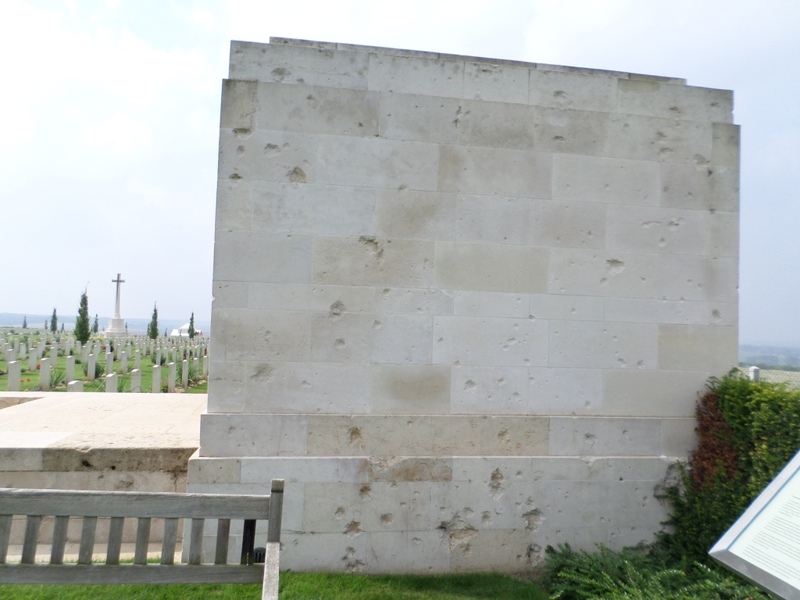 Sever Cemetery Extension, Rouen, France. Allan James Denmead was born at Goulburn, N.S.W. He gave his age as 27 years and 8 months, his marital status as married, and his occupation as labourer, when he enlisted. He joined the Coo-ee March at Bathurst. He was attested at Bathurst on 28th October 1915. He did not complete a medical examination on the Coo-ee March. He was initially discharged as medically unfit with varicous veins on 13th December 1916, but he successfully re-enlisted at Bathurst on 28th June 1916. He embarked for active service from Sydney on HMAT A 11 Ascanius on 26th October 1916 with the 7th reinforcements for the 53rd Battalion. He was transferred to the 19th Battalion after he arrived in England in early 1917. Private Denmead was killed in action on 3rd May 1917 during an attack on the Hindenburg Line at Bullecourt, France, aged 29 years. He has no known grave. His name is remembered on the Villers Bretonneaux Memorial, France. Francis Charles Finlayson was born at Redfern, N.S.W. He gave his age as 28 years, his marital status as married, and his occupation as book keeper, when he enlisted. He joined the Coo-ee March at Parramatta. He completed his medical examination and was attested at Parramatta on 11th November 1915. Acting Corporal Finlayson embarked for active service from Sydney on HMAT A14 Euripides on 9th September 1916, with the 20th reinforcements for the 13th Battalion. He reverted to the rand of Private on arrival in France on 17th January 1917. Private Finlayson was killed in action on 4th February 1917 in an attack on the German trenches in the vicinity of Guedecourt, France, aged 29 years. He has no known grave. 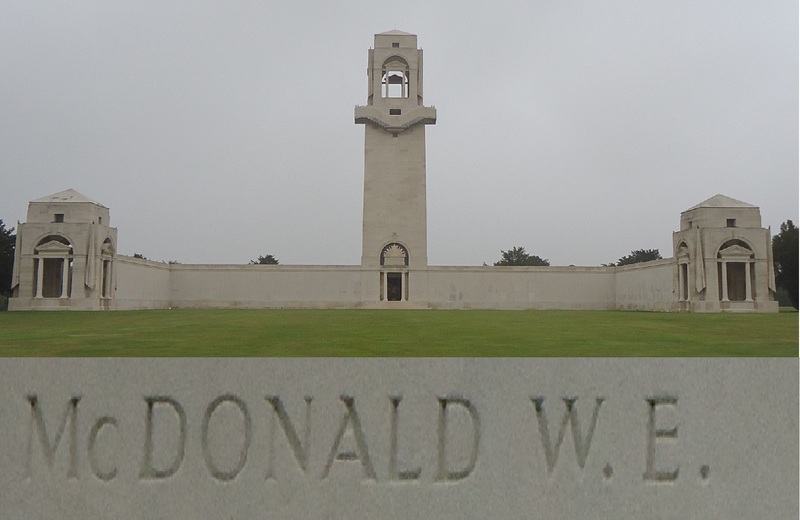 His name is remembered on the on Villers Bretonneaux Memorial, France. 13th Field Company, Australian Engineers, A.I.F. Charles Arthur Finn was born at Mt McDonald, N.S.W. He gave his age as 27 years and 3 months, his marital status as single, and his occupation as blacksmith, when he enlisted. He joined the Coo-ee March at Gilgandra. He completed his medical on 7th October 1915 at Gilgandra and was attested on 9th October 1915 at Gilgandra. He embarked for active service from Sydney on HMAT A26 Armadale on the 21st of March 1916 with the 15th reinforcements for the 1st Field Company Engineers. Sapper Finn was transferred to the 13th Field Company Engineers on 27th August 1916. 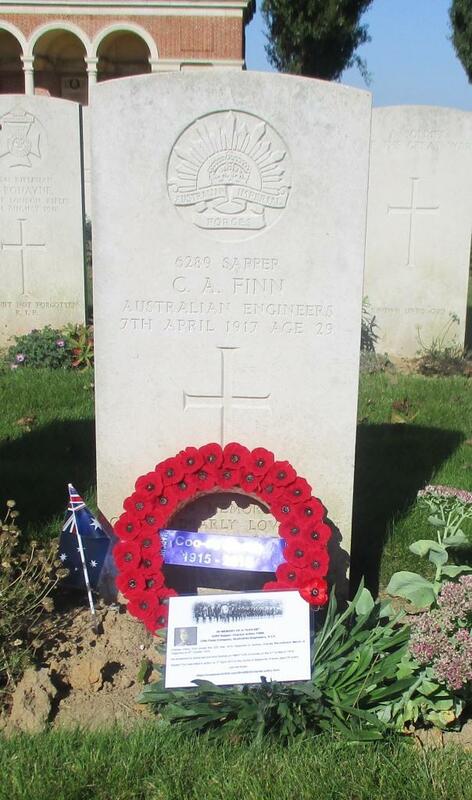 Sapper Finn was killed in action on 7th April 1917 in the vicinity of Bapaume, France, aged 29 years. He was buried at the H.A.C. British Cemetery, Ecoust-St. Mein, France. 10th Field Artillery Brigade A.I.F. Charles Alfred Hampson was born at Petersham, N.S.W. He gave his age as 17 years and 8 months (although he was actually only 16 years and 8 months at this time), his marital status as single, and his occupation as machinist, when he enlisted. He joined the Coo-ee March at Lithgow. He completed his medical on 31st October 1915 at Lithgow, and was attested at Lithgow on the 1st November 1915. On 16th April 1915 Gunner Hampson was transferred to the 4th Division Artillery at Tel-el-Kebir (along with his father Lightfoot). 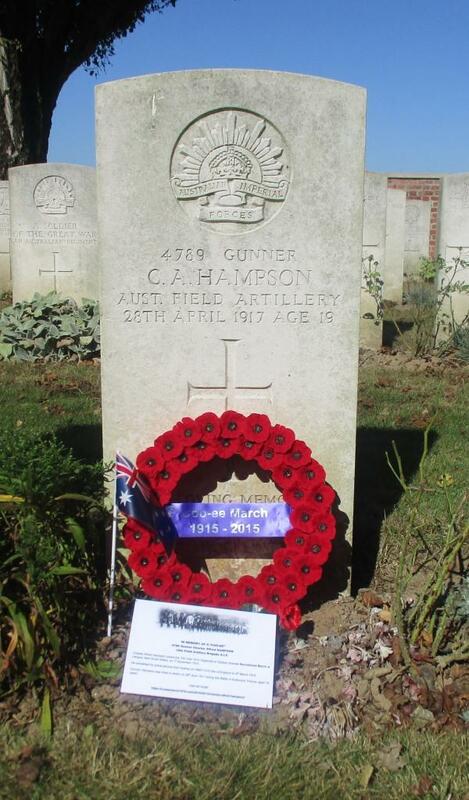 Gunner Hampson was killed in action on 28th April 1917 during the Battle of Bullecourt, France. Although his age is listed as 19 years on his headstone, he was only 18 years and 2 months old when he died. He was buried at the H.A.C. Cemetery, Ecoust-St. Mein, Arras, Nord Pas de Calais, France. Oliver James Harmon was born at Redfern, N.S.W. He gave his age as 31 years and 11 months, his marital status as single, and his occupation as boiler makers’ assistant, when he enlisted. He joined the Coo-ee March at Parramatta. He completed his medical examination on 10th November 1915 at Parramatta, and was attested at Ashfield on 11th November 1915. He embarked for active service from Sydney on HMAT A15 Star of England with the 15th reinforcements for the 13th Battalion on 8th March 1916. 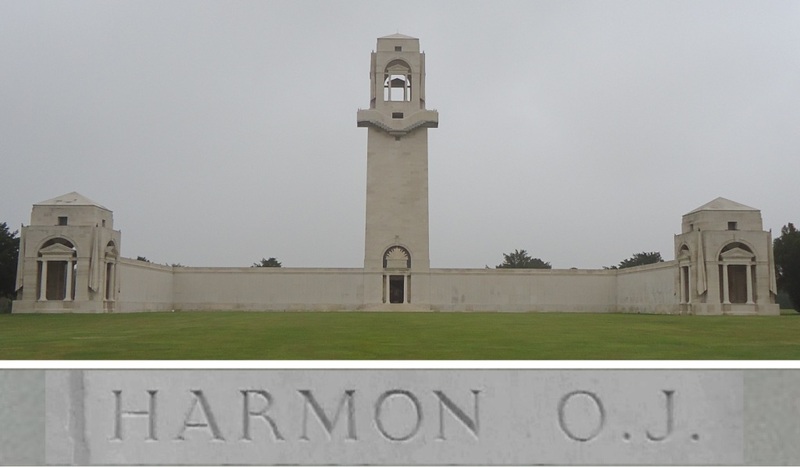 On 16th April 1916 Private Harmon was transferred to the 4th Pioneer Battalion at Tel-El-Kebir, Egypt. Private Harmon was killed in action in the Battle of Pozieres on 6th August 1916, aged 32 years. He has no known grave. His name is remembered on the Villers-Bretonneaux Memorial, France. 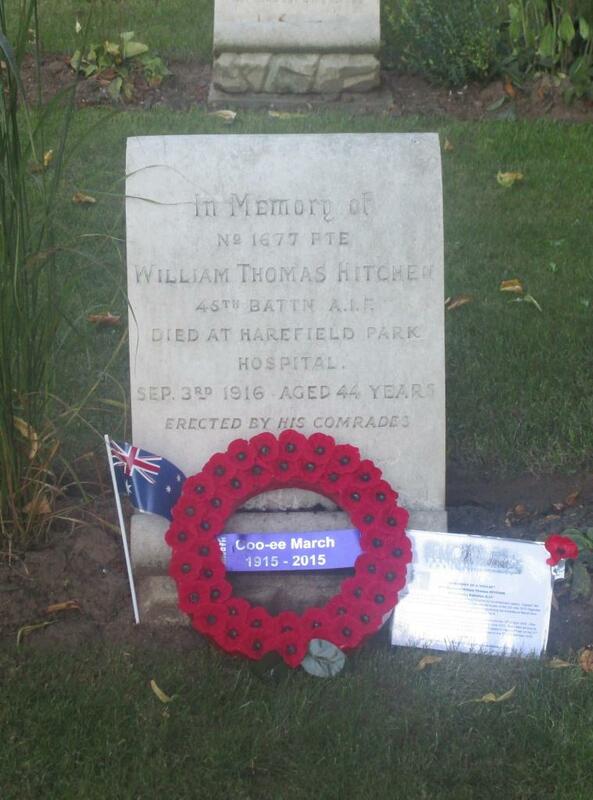 William “Bill” Thomas Hitchen was born at Mudgee, N.S.W. He gave his age as 44 years and 2 months (although he was 51 years old at the time), his marital status as married, and his occupation as plumber, when he enlisted. “Captain” Bill Hitchen was the leader of the Coo-ee March. His official enlistment date is 10th October 1915, the date the Coo-ee March commenced in Gilgandra. However, he did not complete his medical examination and attestation until the 24th February 1916 at Bathurst, after he assisted in organising the Kookaburra March from Tooraweenah to Bathurst in early 1916. He was allocated to the 2nd reinforcements to the 45th Battalion as Corporal. He embarked for active service from Sydney on HMAT A40 Ceramic on the 14th of April 1916. After further training in Egypt, he embarked from Alexandria on the 6th of June 1916. Soon after arriving at Plymouth, England, he was admitted to the 1st Australian Auxiliary Hospital at Harefield Park on 21st June 1916 with Melanotic Sarcoma, where he died of this illness on 3rd September 1916. His age was recorded as 44 years on his headstone. He was buried at the Harefield (St. Mary’s) Churchyard at Harefield, England. Percy Walter Holpen was born at Brisbane, Queensland. He gave his age as 21 years and 11 months (athough he was actually only 17 years and 9 months at this time), his marital status as single, and his occupation as carter, when he enlisted. He joined the Coo-ee March at Wellington. He did a preliminary medical examination at Wellington on 16th October 1915, and was provisionally accepted for enlistment at Dripstone on the 19th October 1915. He embarked for active service from Sydney on HMAT A26 Armadale on 21st March 1916 with the 15th reinforcements for the 1st Light Horse Regiment. He was transferred to the 46th Battalion in France on 10th July 1916. Private Holpen died of illness (Influenza) on 26th November 1918 at the 30th General Hospital, Calais, France, aged 20 years. He was buried at Les Baraques Military Cemetery at Calais, France. Frank Humphrey was born at Hull, Yorkshire, England. He gave his age as 33 years and 3 months, his marital status as single, and his occupation as bricklayer, when he enlisted. He joined the Coo-ee March at Gilgandra. He completed his medical examination and was attested at Gilgandra on 9th October 1915. He was discharged with his services no longer required at Liverpool Camp on 4th January 1916. However he re-enlisted at Wangaratta in Victoria on 11th February 1916. He embarked for active service from Melbourne on HMAT A17 Port Lincoln on 1st May 1916 with the 3rd reinforcements for the 60th Battalion. Soon after his arrival in France, Private Humphrey died of illness (Bacillary Dysentery) on 23rd August 1916 at the 7th Canadian Stationary Hospital at Le Harve, France, aged 34 years. He was buried at Ste Marie Cemetery, Le Harvre, France. William Emerton Hunter was born at Sydney, N.S.W. He gave his age as 21 years and 1 month, his marital status as single, and his occupation as wheat lumper, when he enlisted. He joined the Coo-ee March at Geurie. He completed his medical examination on 16th October 1915 at Wellington, and was attested at Dripstone on 19th October 1915. He embarked for active service from Sydney on HMAT A15 Star of England on 8th March 1916 with the 15th reinforcements for the 13th Battalion. On 19th April 1916 Private Hunter was transferred to the 45th Battalion at Tel-el-Kebir. Private Hunter was killed in action on 7th August 1916, in the vicinity of Pozieres, France, aged 21 years. He embarked for active service from Sydney on HMAT A15 Star of England on 8th March 1916 with the 15th reinforcements for the 13th Battalion. Private Jackson was killed in action on 16th June 1917, in the vicinity of Messines, Belgium, aged 33 years. Alan Chesher [Chester] Johnson (aka Alan Cheshyre Janion) was born at Liverpool, England. He gave his age as 33 years (though this may not have been correct), his marital status as single, and his occupation as labourer, when he enlisted. He joined the Coo-ee March at Wellington. He completed his medical examination on 16th October 1915 at Wellington, and was attested at Dripstone on the 19th October 1915. He embarked for active service from Sydney on HMAT A15 Star of England on 8th March 1916 with the 15th reinforcements for the 13th Battalion. On 19th April 1916 he transferred to the 45th Battalion in Egypt. Private Johnson was killed in action on 7th June 1917 in the vicinity of Messines, Belgium. 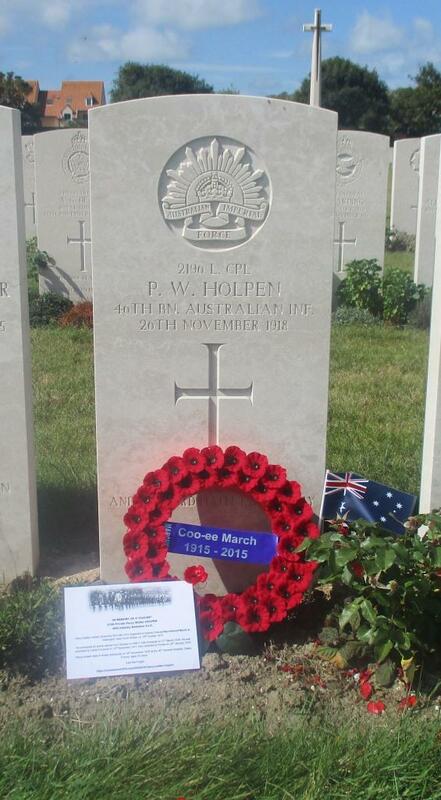 His age at time of death was listed as 31 years on his AWM Roll of Honour Circular. Darcy Keating was born at Warren, N.S.W. He gave his age as 21 years and 6 months (though it appears that he was younger), his marital status as single, and his occupation as labourer, when he enlisted. He joined the Coo-ee March at Wellington. He completed his medical on16th October 1915 at Wellington, and was attested at Mumbil on 19th October 1915. He embarked for active service from Sydney on HMAT A46 Clan McGillivray on 3rd May 1916 with the 2nd reinforcements for the 1st Anzac Cyclist Battalion. Private Keating on 7th September 1916 was transferred to the 1st Training Battalion at Perham Downs, England. He joined the 4th Australian Infantry Battalion in France on 5th November 1916. He was promoted to Lance Corporal on 15th July 1917. Lance Corporal Keating was killed in action on 4th October 1917 in the vicinity of Broodseinde Ridge, Belgium. 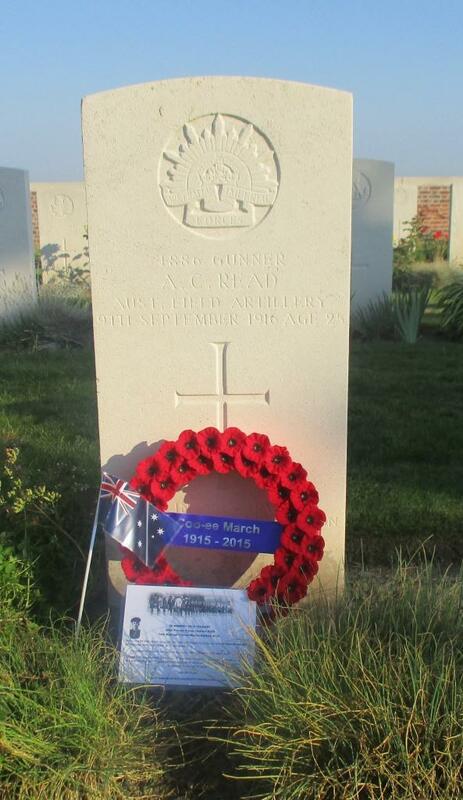 His age was recorded as 20 years at time of death on his AWM Roll of Honour Circular. Lewis (Louis) Leoville was born at Marseilles, France. He gave his age as 41 years, his marital status as married, and his occupation as barber. He joined the Coo-ee March at Lithgow. He completed his medical on 3rdNovember 1915 at Lithgow, and was attested at Lithgow on the same day. He embarked for active service from Sydney on HMAT A71 Nestor on 9th April 1916, with the 17th reinforcements for the 13th Battalion. He was transferred to the 45th Battalion on 20th May 1916 in Egypt. Private Leoville was wounded in action in the vicinity of Pozieres, France, on 8th August 1916. He died of his wounds later that day, aged 42 years. He was buried at Warloy-Baillon Communal Extension Cemetery, at Warloy-Baillon, France. Spencer John Letcher was born at Cowra, N.S.W. He gave his age as 18 years and 1 month (although he was actually only 16 years and 7 months at that time), his marital status as single, and his occupation as painter, when he enlisted. He joined the Coo-ee March at Bathurst. He completed his medical examination and was attested at Bathurst on 28th October 1915. 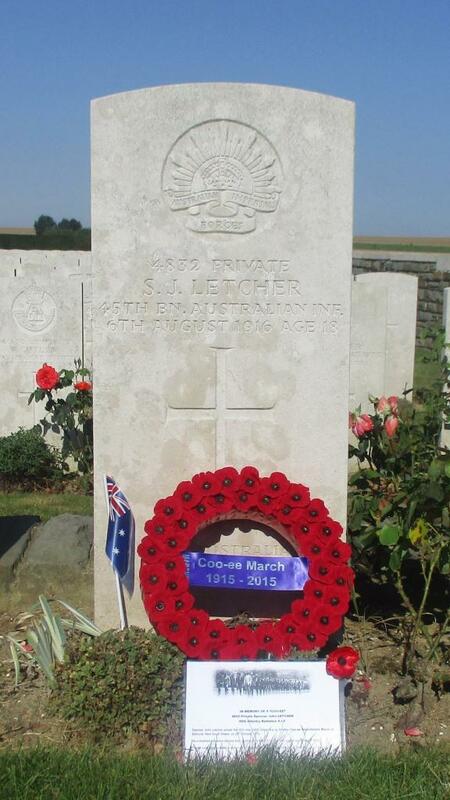 Private Letcher was killed in action on 6th August 1916 in vicinity of Pozieres, France. Although his age was recorded as 18 years on his headstone, he was actually only 17 years and 4 months at the time of his death. He was buried at the A.I.F. Burial Ground, at Flers, France. Samuel Luke was born at St. Marys, N.S.W. He gave his age as 38 years and 11 months, his marital status as single, and his occupation as labourer, when he enlisted. He joined the Coo-ee March at St. Marys. . He completed his medical examination and was attested at Ashfield on 11th November 1915. He embarked for active service from Sydney on HMAT A15 Star of England on 8th March 1916 with the 15th reinforcements for the 13th Battalion. On 25th April 1916 he transferred to the 4th Pioneer Battalion at Serapeum, Egypt. 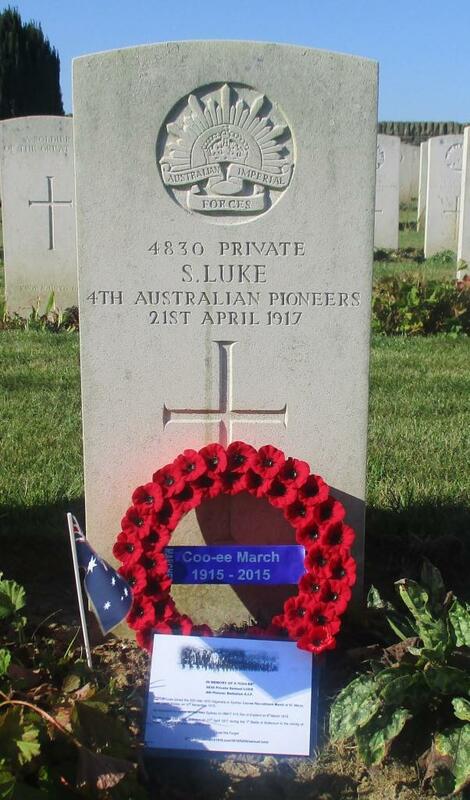 Private Luke was killed in action on 21st April 1917 during the 1st Battle of Bullecourt in the vicinity of Vaulx-Vraucourt, France, aged 40 years. He was buried at the Vaulx Hill Cemetery, at Vaulx-Vraucourt, France. Laurence Leslie Maguire was born at Gilgandra, N.S.W. He gave his age as 25 years and 11 months, his marital status as single, and his occupation as labourer, when he enlisted. He joined the Coo-ee March at Gilgandra. He completed his medical examination at Gilgandra on 8th October 1915, and was attested at Gilgandra on 9th October 1915. He embarked for active service from Sydney on HMAT A15 Star of England on 8th March 1916 with the 15th reinforcements for the 13th Battalion. On 20th May 1916 he transferred to the 45th Battalion in Egypt. He was promoted to Lance Corporal on 1st November 1917. 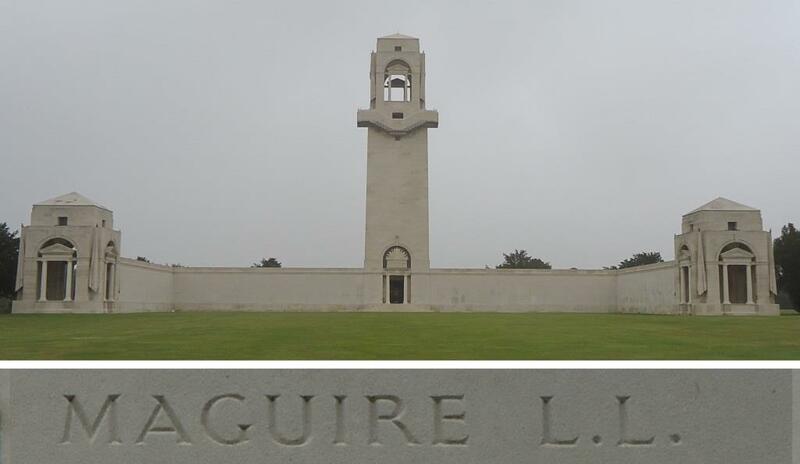 Lance Corporal Maguire was killed in action on 2nd April 1918, in the vicinity of Dernacourt, France. He was buried near Albert, but after the war his grave could not be located. His age at time of death was recorded as 28 years on his AWM Roll of Honour Circular. John Martin was born at Melbourne, Victoria. He gave his age as 34 years 10 months, his marital status as single, and his occupation as labourer, when he enlisted. He joined the Coo-ee March at Molong. He completed his medical examination and was attested at Molong on 22nd October 1915. He embarked for active service from Sydney on HMAT A70 Ballarat on 16th February 1916 with the 14th reinforcements for the 13th Battalion. On 1st April 1916 he was transferred to the 54th Battalion at Ferry Post, Egypt. He was promoted to Corporal on 27th May 1917. Corporal Martin was killed in action on 1st September 1918 at Peronne, France, aged 38 years. He was buried at the Peronne Communal Cemetery Extension, at Peronne, France. 4th Division Heavy and Medium Trench Mortar Battery Field Artillery A.I.F. Wilfred Ernest McDonald was born at Dubbo, N.S.W. He gave his age as 21 years and 1 month, his marital status as single, and his occupation as labourer. He completed his medical on the 8th October at Gilgandra before the beginning of the Coo-ee March. 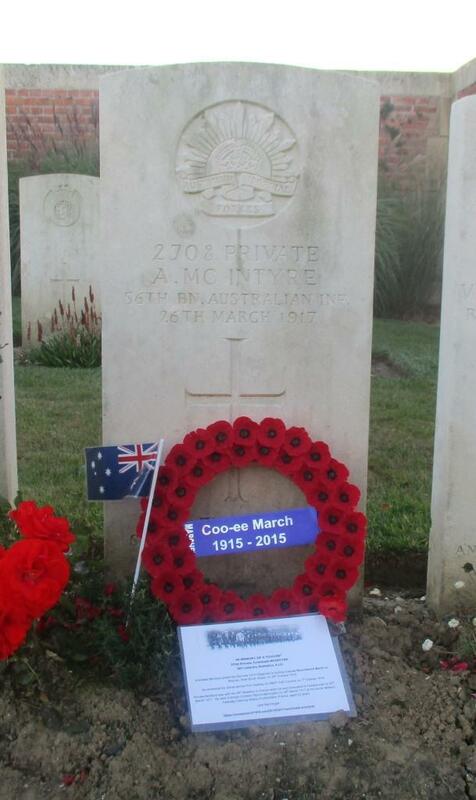 He presented to join the Coo-ee March at his home town of Wongarbon on 14th October 1915. He was attested at Stuart Town on 19th October 1915. He embarked for active service from Sydney on HMAT A15 Star of England on 8th March 1916 with the 15th reinforcements for the 13th Battalion. On the 16th of April 1916 he transferred to the 4th Division Artillery at Telelkebir. On the 27th May 1916 he was taken on strength of the 4th Division Ammunition Column. On the 25th June 1916 Gunner McDonald was transferred to the V4 Heavy Trench Mortar Battery. Gunner McDonald was killed in action on 3rd May 1917 between Ecoust and Bullecourt in France, aged 22 years. Edward Joseph McGarry was born at Kelso, N.S.W. He gave his age as 35 years and 8 months, his marital status as married, and his occupation as fuelman, when he enlisted. He joined the Coo-ee March at Bathurst. He was attested at Bathurst on 28th October 1915, but did not complete his medical until 13th November October 1915 at Liverpool. He embarked for active service from Sydney on HMAT A15 Star of England on 8th March 1916 with the 15th reinforcements for the 13th Battalion. On 16th April 1916 he transferred to the 4th Pioneer Battalion in Egypt. Private McGarry was wounded in action on 12th December 1916 in the vicinity of Longueval, France. He died of his wounds the next day on 13th December 1916 at the 38th Casualty Clearing Station at Heilly, France, aged 35 years (per his headstone and AWM Roll of Honour Circular). He was buried at Heilly Station Cemetery, at Mericourt-L’Abbe, France. Joseph Raymond McGuire was born at Redfern, N.S.W. He gave his age as 33 years and 10 months, his marital status as single, and his occupation as tinworker labourer, when he enlisted. 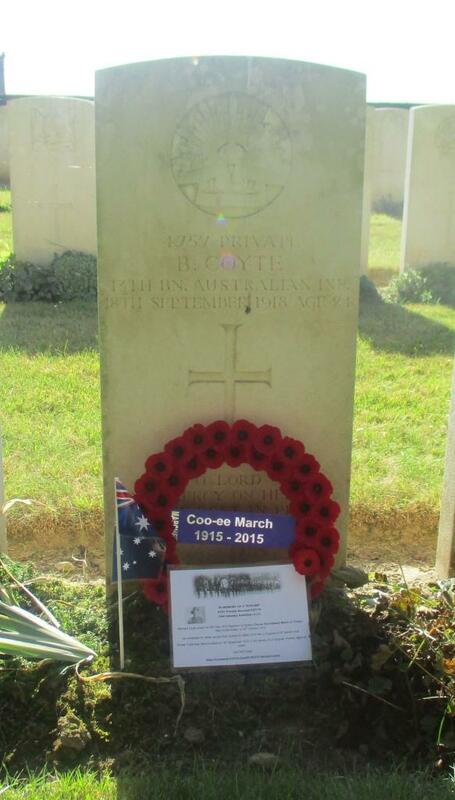 He joined the Coo-ee March on 11th November 1915, the day the Coo-ees marched from Parramatta to Ashfield. He completed his medical examination and was attested at Ashfield on 11th November 1915. 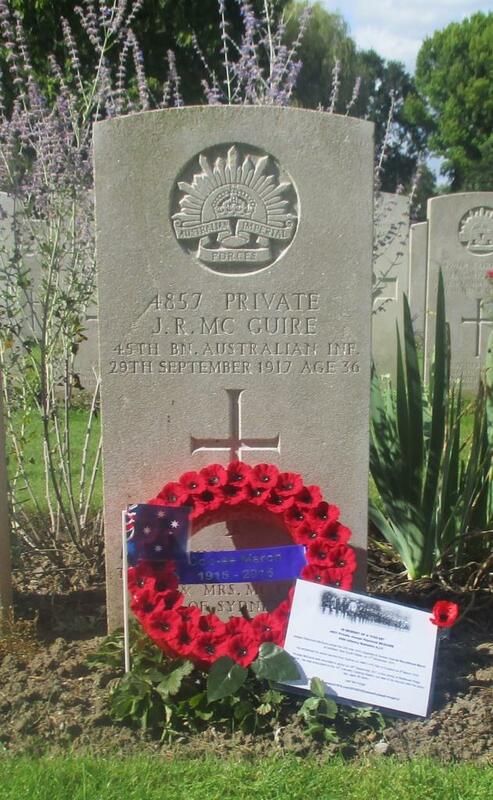 Private McGuire was wounded in action on 29th September 1917 in the vicinity of Westhoek Ridge, Belgium. He was evacuated to the 10th Casualty Clearing Station, but died of his wounds later the same day, aged 36 years. He was buried at Lijssenthoek Military Cemetery, at Lijssentoek, Belgium. Archibald McIntyre was born at Glasgow, Scotland. He gave his age as 31 years and 6 months, his marital status as single, and his occupation as labourer, when he enlisted. He joined the Coo-ee March at Blayney. He completed his medical examination and was attested at Blayney on 26th October 1915. He was discharged at Liverpool Camp on 29th November 1915 for defective vision. He successfully re-enlisted on 19th May 1916 at Sydney, passing his medical examination on 19th May 1916, and was attested at the Royal Agricultural Showground at Sydney on 20th May 1916. He embarked for active service from Sydney on HMAT A40 Ceramic on 7th October 1916 with the 6th reinforcements for the 56th Battalion. Private McIntyre was with the 56th Battalion in France when he was evacuated to hospital sick on 22nd March 1917. He died of illness (Cerebro Spinal Meningitis) on 26th March 1917 at the South Midland Casualty Clearing Station Puchevillers, France, aged 32 years. He was buried at Puchevillers British Cemetery, at Puchevillers, France. Charles James “Jack” Morris was born at Pennant Hills, N.S.W. He gave his age as 18 years and 1 month, his marital status as single, and his occupation as rivetter, when he enlisted. He joined the Coo-ee March at Parramatta. He completed his medical examination and was attested at Parramatta on 11th November 1915. Private Morris was killed in action on the night of 5th/6th August 1916, in the vicinity of Pozieres, France, aged 18 years. 7th Light Horse Regiment A.I.F. William Henry Nicholls was born at Camperdown, Sydney, N.S.W. He gave his age as 27 years and 6 months, his marital status as single, and his occupation as contractor, when he enlisted. He completed his medical examination at Coonamble on 2nd October 1915, and was attested at Dubbo on 21st October 1915, before joining the Coo-ee March at Molong. He embarked for active service from Sydney on HMAT Palermo on 18th April 1916 with the 16th reinforcements for the 7th Light Horse Regiment. Trooper Nicholls was killed in action on 7th May 1918 when enemy aeroplanes bombed the camp of the 7th Light Horse Regiment at Jericho, Palestine. He was aged 30 years. He was buried at the Jerusalem War Cemetery at Jerusalem, Israel. Karl Alex Frederick Nielson (aka Karl Frederik Nielsen) was born at Sjelland, Denmark. He gave his age as 24 years and 11 months, his marital status as single, and his occupation as bushman, when he enlisted. Although he was not attested and did not complete his medical examination until 13th November 1915 at Liverpool, his date of joining on the nominal roll was recorded as the 8th November 1915, when the Coo-ees were on their way from Lawson to Springwood. Per The Blue Mountains Echo he was one of three recruits to join the Coo-ees from Hazelbrook. 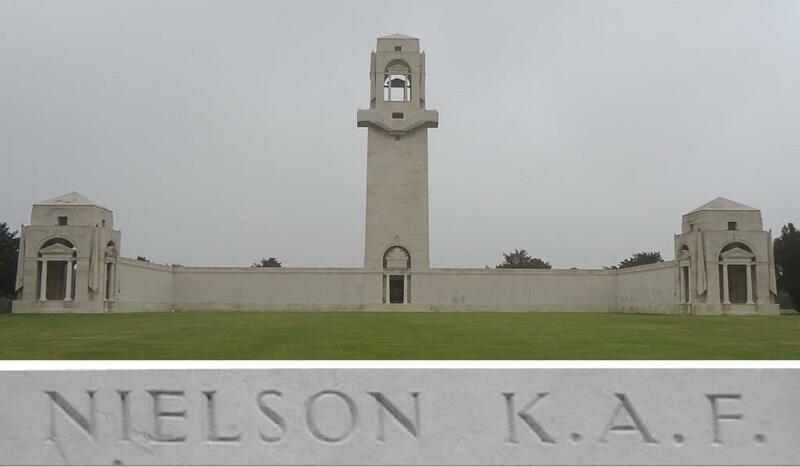 Private Nielsen was killed in action on 6th August 1916 in the vicinity of Pozieres, France, aged 25 years. He has no known grave. His name is remembered on Villers-Bretonneaux Memorial, France. Patrick Joseph O’Loughlin (O’Loughlen) was born at Ballyvaugan, County Clare, Ireland. He gave his age as 27 years and 8 months, his marital status as single, and his occupation as labourer, when he enlisted. He was one of the four recruits sent by the Parkes Recruiting Association to join the Coo-ees at Molong. He completed his medical examination at Molong on 22nd October 1915, and was attested at Molong (8 miles east) on 22nd October 1915. He was discharged medically unfit (varicose veins) on 29th November 1915. However he successfully re-enlisted at Dubbo Army Camp on 27th October 1916. He embarked for active service from Sydney on HMAT A24 Benalla on 9th November 1916 with the 23rd reinforcements for the 3rd Battalion. Private O’Loughlin was killed in action on 18th September 1917 in the vicinity of Dickebusch, near Ypres, in Belgium, aged 29 years. James O’Neill was born at Hay, N.S.W. He gave his age as 35 years, his marital status as single, and his occupation as labourer, when he enlisted. He joined the Coo-ee March at Wellington. completed his medical examination on 17th October 1915 at Wellington, and was attested on 19th October 1915 at Stuart Town. He embarked for active service from Sydney on HMAT A11 Ascanius on 25th October 1916 with the 17th reinforcements for the 18th Battalion. Private O’Neill was wounded in action on 19th September 1917 at Bellewaarde Ridge, Belgium. 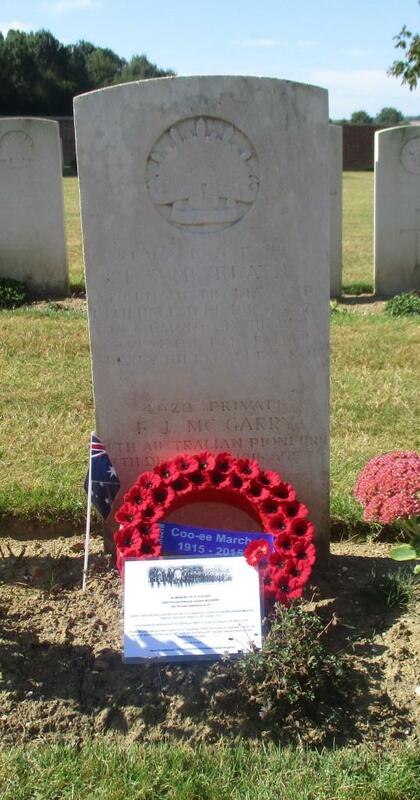 He was evacuated to the 3rd Australian Field Ambulance, where he died of his wounds later that day, aged 37 years. He was buried at Menin Road South Military Cemetery, at Iepers, Belgium. 4th Machine Gun Battalion A.I.F. Joseph Parrish was born at Monmouthshire, Wales. He gave his age as 18 years and 5 months, his marital status as single, and his occupation as miner, when he enlisted. He presented to join the Coo-ees at Wellington. He completed his medical examination on 16th October 1915 at Wellington, then joined the Coo-ees at Orange, where he was attested at Orange on the 24th October 1915. He embarked for active service from Sydney on HMAT A15 Star of England on 8th March 1916 with the 15th reinforcements for the 13th Battalion. On the 16th April 1916 Private Parrish was transferred to the 4th Pioneer Battalion at Tel-el-Kebir. On the 12th May 1918 Private Parrish was transferred to the 4th Machine Gun Battalion. Private Parrish was wounded in action on 10th June 1918 in the vicinity of Villers-Bretonneux, France. He died of his wounds on 27th June 1918 at the 53rd General Hospital at Abbeville, France, aged 21 years. He was buried at Terlincthun British Cemetery, at Wimille, France. 4th Division Medium Trench Mortar Battery A.I.F. Arthur Charles Reid (Read) was born at Forbes, N.S.W. He gave his age as 25 years, his marital status as single, and his occupation as shearing machine expert, when he enlisted. He joined the Coo-ee March by the time the Coo-ees reached Katoomba. He was attested on 5th November at Katoomba, and completed his medical examination on 6th November 1915 at Lawson. He embarked for active service from Sydney on HMAT A15 Star of England on 8th March 1916 with the 15th reinforcements for the 13th Battalion. On 16th April 1916 Private Reid transferred to the 4th Division Artillery and his rank designation changed to Gunner. On the 25th June 1916 he was taken on strength of the 4th Division Medium Trench Mortar Battery in France. Gunner Reid was wounded in action on 8th September 1916 in the vicinity of Vierssraat, Belgium. He was evacuated to the 11th Canadian Field Ambulance, where he died of his wounds the next day on 9th September 1916, aged 25 years. He was buried at La Clytte Military Cemetery, De Klitje, Flanders, Belgium. John Thomas Smith was born at Wigan, Lancashire, England. He gave his age as 30 years, his marital status as single, and his occupation as miner, when he enlisted. He joined the Coo-ee March at Wellington. He completed his medical examination on 16th October 1915 at Wellington, and was attested on 19th October 1915 at Stuart Town. He embarked for active service from Sydney on HMAT A15 Star of England on 8th March 1916 with the 15th reinforcements for the 13th Battalion. On 25th April 1916 he transferred to the 4th Pioneer Battalion at Tel-el Kebir. Private Smith was wounded in action on 5th April 1918 near Henencourt Wood, France. He was evacuated to England, and died of his wounds on 23rd April 1918 at the Dorset County Hospital, England, aged 33 years. He was buried at Melcombe Regis Cemetery, at Dorset, England. Stanley Everard Stephens was born at Melbourne, Victoria. He gave his age as 24 years and 11 months, his marital status as single, and his occupation as journalist, when he enlisted. He joined the Coo-ee March at Gilgandra. He completed his medical examination and was attested at Gilgandra on 9th October 1915. On the march he was given the rank of Acting Sergeant, and was appointed Secretary of the travelling committee of control appointed for the Coo-ee March at Stuart Town. .
Acting Sergeant Stephens embarked for active service from Sydney on HMAT A14 Euripides on 9th September 1916 as 20th reinforcement for the 13th Battalion. On 22nd December 1916 he arrived at the 4th Australian Division Base Depot at Etaples, France, where he reverted to the rank of Private. Acting Sergeant Stephens departed Sydney on the HMAT A14 Euripides on 9th September 1916 as 20th reinforcement for the 13th Battalion. His rank reverted to Private when he arrived in France on 22nd December 1916. Private Stephens was killed in action on 11th April 1917 during an attack on the Hindenburg Line near Bullecourt, France, aged 26 years. John Tarlington was born at Glen Innes, N.S.W. He gave his age as 38 years and 7 months, his marital status as married, and his occupation as laborer, when he enlisted. He joined the Coo-ee March at Blayney. He completed his medical examination and was attested at Blayney on 26th October 1915. He embarked for active service from Sydney on HMAT A70 Ballarat on 16th February 1916 with the 14th reinforcements for the 13th Battalion. On 1st April 1916 he was transferred to the 54th Battalion at Ferry Post, Egypt. On 23rd May 1916 Private Tarlington was transferred to the 4th Pioneer Battalion in Egypt. Private Tarlington was killed in action on 6th August 1916 in the vicinity of Pozieres, France, aged 39 years. Thomas Thorne was born at Hay, N.S.W. He gave his age as 22 years and 2 months, his marital status as married, and his occupation as motor driver, when he enlisted. He joined the Coo-ee March at Lawson, and was attested at Lawson on the 7th November 1915. He completed his medical examination at Liverpool on 13th November 1915. He embarked for active service from Sydney on HMAT A15 Star of England on 8th March 1916 with the 15th reinforcements for the 13th Battalion. He arrived in Egypt on 11th April 1916, and he was admitted to the 31st General Hospital at Port Said, Egypt, on the same day. He was discharged for duty on 21st May 1916. Acting Sergeant Thorne was admitted to Devonport Military Hospital on his arrival in England, and he died of Pneumonia two days later on 18th June 1916, aged 23 years. He was the first of the Coo-ees to die on active service. He was buried at Plymouth (Efford) Cemetery, at Plymouth, England. Joseph Patrick Wallis (aka Joseph Patrick Wailes) was born at Darlinghurst, N.S.W. He gave his age as 18 years and 4 months (although he was actually 17 years and 1 month old at that time), his marital status as single, and his occupation as seaman, when he enlisted. He joined the Coo-ee March at Dubbo. He completed his medical examination and was attested at Dubbo on 13th October 1915. He embarked for active service from Sydney on HMAT A70 Ballarat on 16th February 1916 with the 14th reinforcements for the 13th Battalion. On 1st April 1916 he was transferred to the 54th Battalion I Egypt. 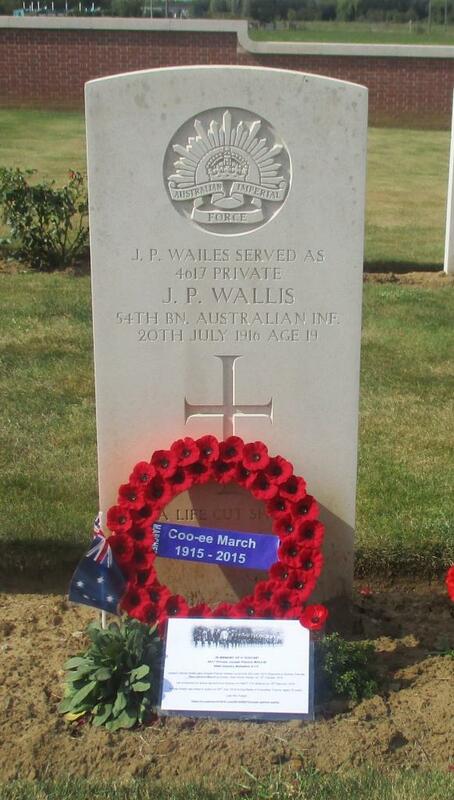 Private Wallis was killed in action on 20th July 1916 during Battle of Fromelles, France. 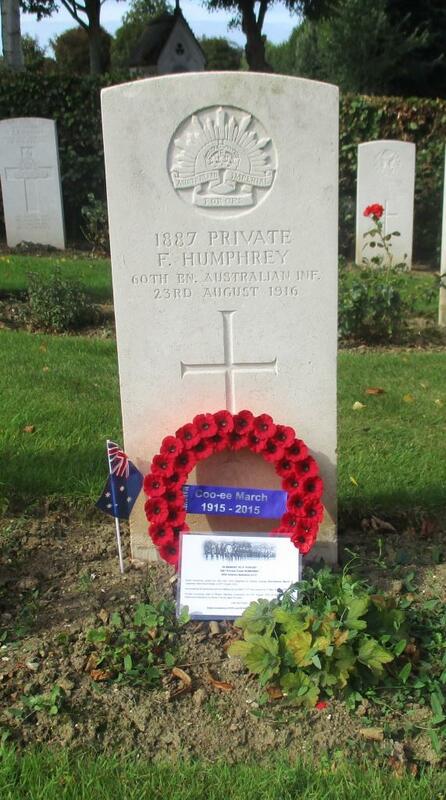 He was buried at Fromelles (Pheasant Wood) Military Cemetery, Fromelles, France. Although his headstone records his age as 19 years, he was actually only 17 years and 10 months when he died. William Webber was born at Granville, N.S.W. He gave his age as 23 years and 5 months, his marital status as single, and his occupation as fitter, when he enlisted. 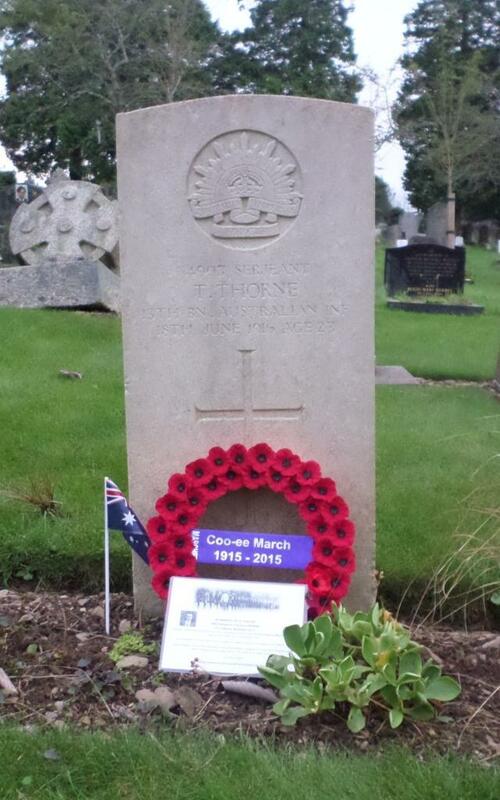 He joined the Coo-ee March on 11th November 1915, the day the Coo-ees marched from Parramatta to Ashfield. He completed his medical examination and was attested at Ashfield on 11th November 1915. Private Webber was killed in action on 6th April 1918 in the vicinity of Dernacourt, France, aged 26 years. Rowland John Wilson was born at Tallawang, N.S.W. He gave his age as 24 years, his marital status as single, and his occupation as labourer, when he enlisted. He joined the Coo-ee March at Lawson. He was attested at Lawson on 7th November 1915. He completed his medical examination at Liverpool on 15th November 1915. Private Wilson was killed in action on the night of the 7th/8th August 1916 in the Battle of Pozieres between Pozieres and Martinpuich, aged 24 years. Per his military service record (regimental no. 4910), Rowland John Wilson was born at Tallawang, N.S.W. He gave his age as 24 years and 1 month, his marital status as single, and his occupation as labourer. His description on his medical was height 5 feet 6 inches tall, weight 10 stone 6 lbs., with a fair complexion, grey eyes, and brown hair. His religious denomination was Roman Catholic. He claimed that he had 3 months experience with the Lawson Rifle Club. The “Joined on” date on his Attestation Paper was 7th November 1915. He was attested at Lawson on 7th November 1915. After completing the march he went to Liverpool Camp as reinforcement for the 13th Battalion. He completed his medical examination at Liverpool on 15th November 1915. On his embarkation roll he is listed under the name Ronald John Wilson, and his address at time of enrolment was Queens Road, Lawson, N.S.W. His next of kin is listed as his brother [i.e. uncle], P. J. Wilson, Queens Road, Lawson, N.S.W. On 8th March 1916 Private Wilson along with many of the other Coo-ees departed Sydney on the HMAT A15 Star of England, and arrived in Egypt on the 11th April 1916. On the 19th April 1916 Private Wilson was transferred to the 45th Battalion at Tel-el-Kebir. On the 2nd June 1916 Private Wilson left Alexandria aboard the transport Kinfauns Castle bound for France, arriving at Marseilles on the 8th June 1916. Private Wilson served with the 45th Battalion during its first action at Fleurbaix, France in July 1916. Private Wilson then moved with the 45th Battalion to Pozieres, France, in early August 1916. Private Wilson was killed on the night of the 7th/8th August 1916 when the 45th Battalion was under heavy enemy artillery fire between Pozieres and Martinpuich in the Battle of Pozieres – the same night that fellow Coo-ee William Emerton Hunter was killed, who was also in the 45th Battalion. Private Wilson’s date of death is recorded as 8th August 1916. He has no known grave. 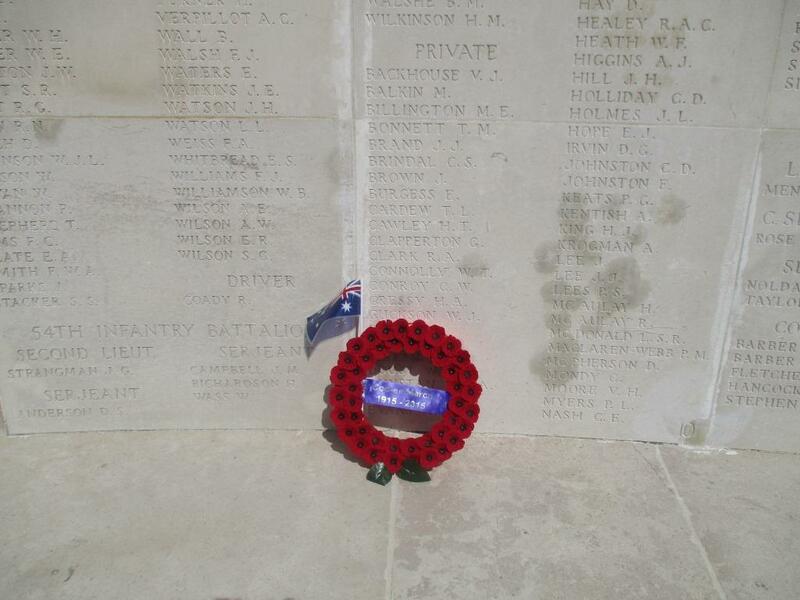 Private Wilson is remembered on the Australian National Memorial at Villers-Bretonneux in France. 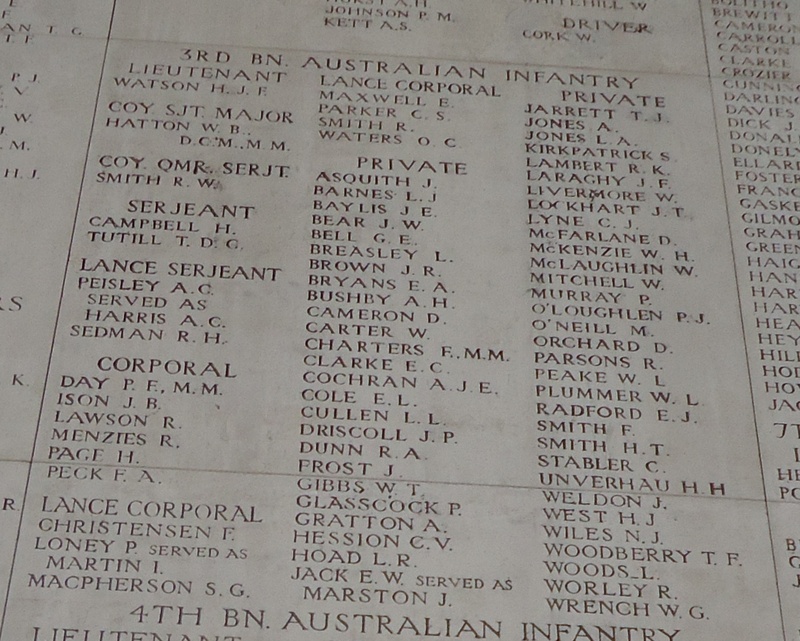 Private Wilson’s name is commemorated on panel 141 on the Australian War Memorial First World War Roll of Honour. His name is also remembered on the Lawson War Memorial. On 7th August 2014 Stephen and I visited the Australian National Memorial at Villers-Bretonneux Military Cemetery, which is located about 2 km north of the village of Villers-Bretonneux. It was our second visit to this memorial. The photograph below shows the Villers-Bretonneus Memorial, with some of the headstones in the Villers-Bretonneux Military Cemetery in the foreground. Red poppies grow in the garden beds near the entrance to the memorial. Beautiful roses and other flowers are planted in amongst the graves in the cemetery section. Bullet holes from World War II German aircraft can be seen on a wall, and on the tower. 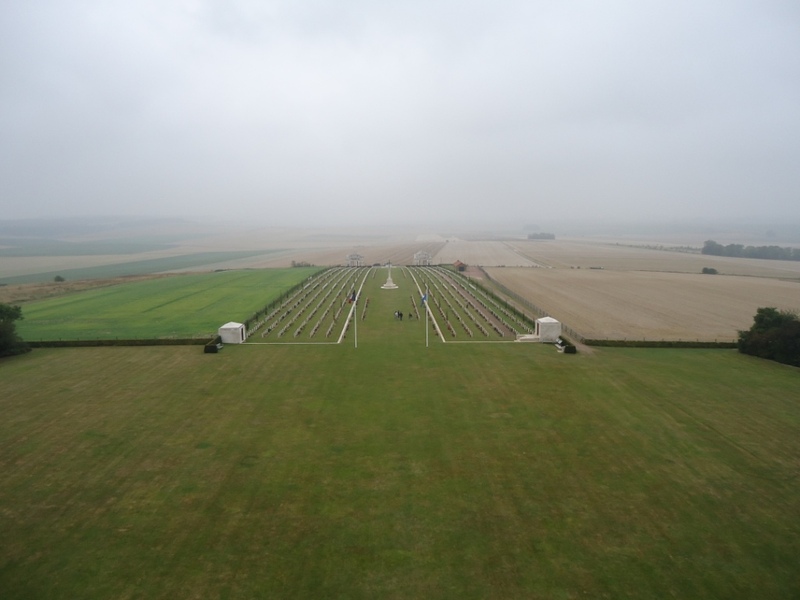 The photograph below, taken from the tower at the top of the memorial, looking towards the main entrance, shows the size of the beautifully laid out site, and the rolling hills of the surrounding French countryside. 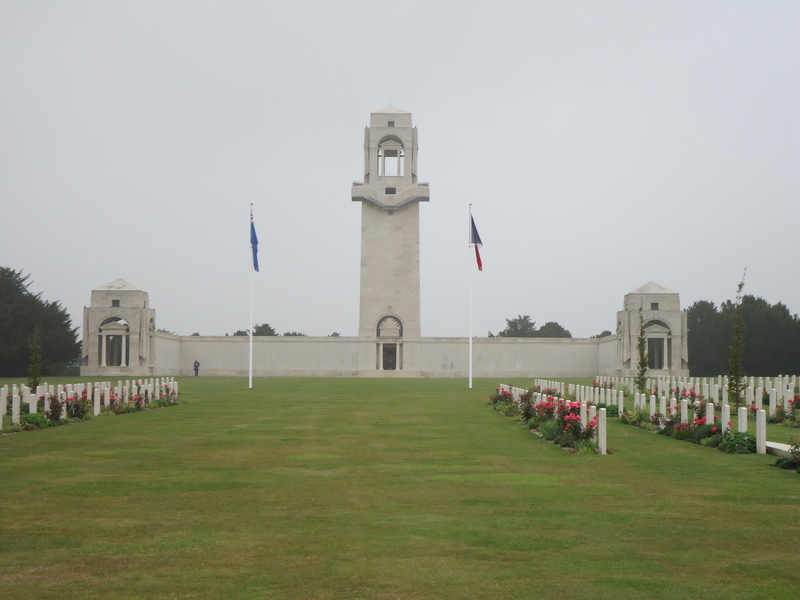 This Australian National Memorial was erected to commemorate all Australian soldiers who fought and died in France and Belgium during the First World War, and to name those who have no known grave. 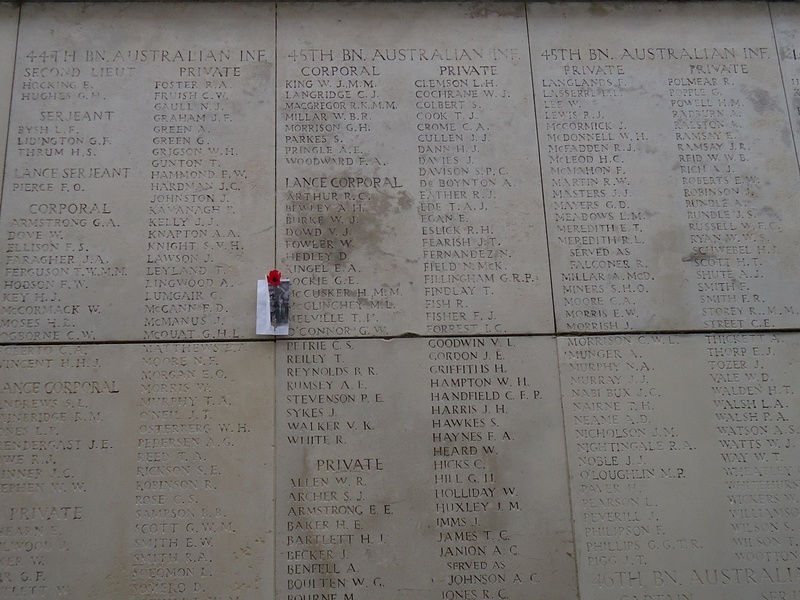 According to the Commonwealth War Graves Commission website http://www.cwgc.org/, the names of 10,762 Australian soldiers are commemorated by this memorial. They died in the battlefields of the Somme, and Arras, and in the advance by the Germans in 1918, and the Allied advance to victory. The memorial is situated behind the Villers-Bretonneux Military Cemetery, which contains the remains of graves brought in from other burial grounds and the battlefields in the area. The names of 12 Coo-ees are commemorated at this memorial. Their names are listed in unit order on the walls. A photograph of their name on the Villers-Bretonneux Memorial will be placed on each individual Coo-ee’s blog entry, and form part of a Roll of Honour for the fallen Coo-ees on this blog. 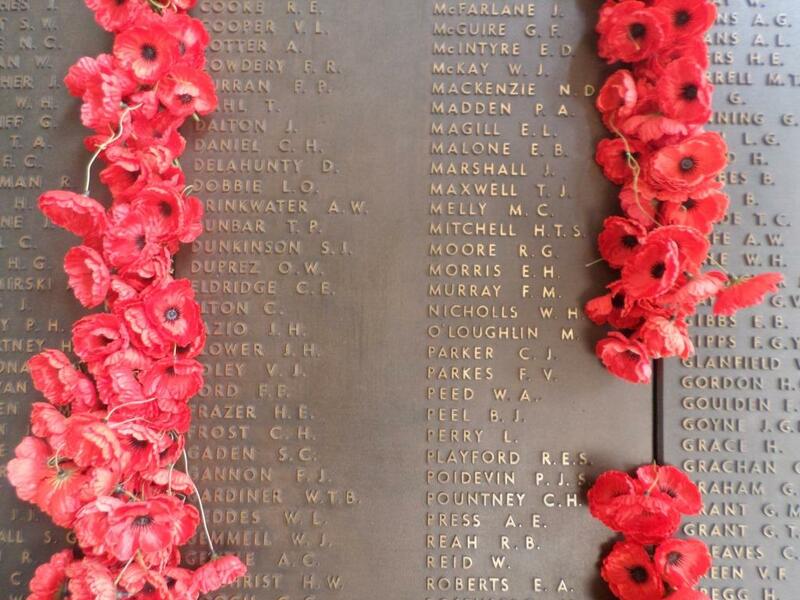 Last weekend (3rd-5th January 2015) Stephen and I visited the Australian War Memorial. We attended the Last Post Ceremony on the Saturday evening, and listened to the story presented on a local WWI soldier from Wongarbon. On Sunday morning we located and photographed the names of the fallen Coo-ees on the Roll of Honour bronze panels. 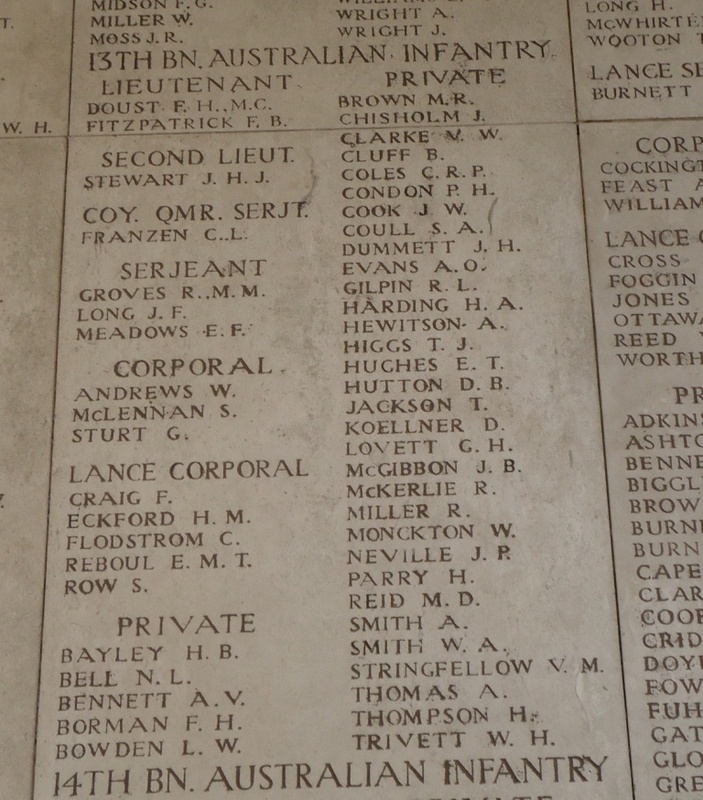 I noted the names of Coo-ees Louis Leoville (who joined the Coo-ee March at Lithgow) and Spencer John Letcher (who joined at Bathurst) are next to each other on the Roll of Honour in the 45th Battalion section. We placed poppies next to their names in remembrance of them. Researching their stories this week I was saddened to learn that they both died within three days of each other, while fighting in the front lines at Pozieres in France – Spencer John Letcher being killed in action on the 6th August 1916, and Louis Leoville dying of wounds on the 8th August 1916. 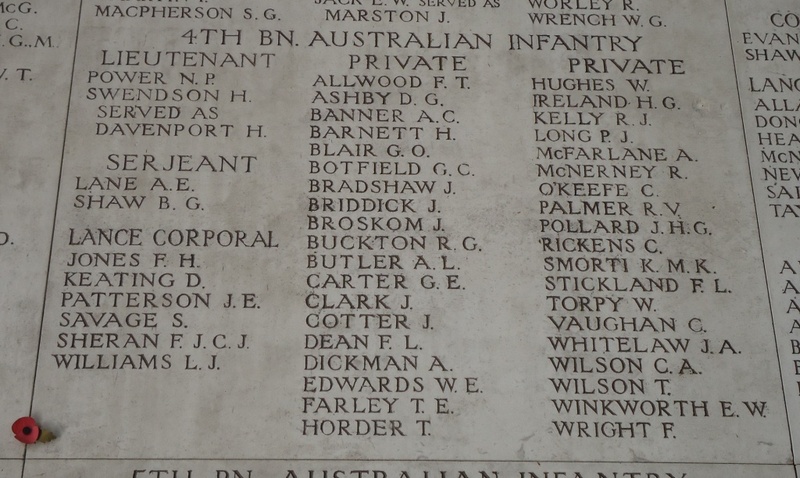 Three more Coo-ees on the 45th Battalion Roll of Honour who also died while the Battalion was at Pozieres in this three day period are William Emerton Hunter (who joined at Geurie), Jack Morris (who joined at Parramatta), and Rowland John Wilson (who joined at Lawson). Jack Morris was killed on the 6th August 1916, William Emerton Hunter on the 7th August 1916, and Rowland John Wilson on the 8th August 1916. 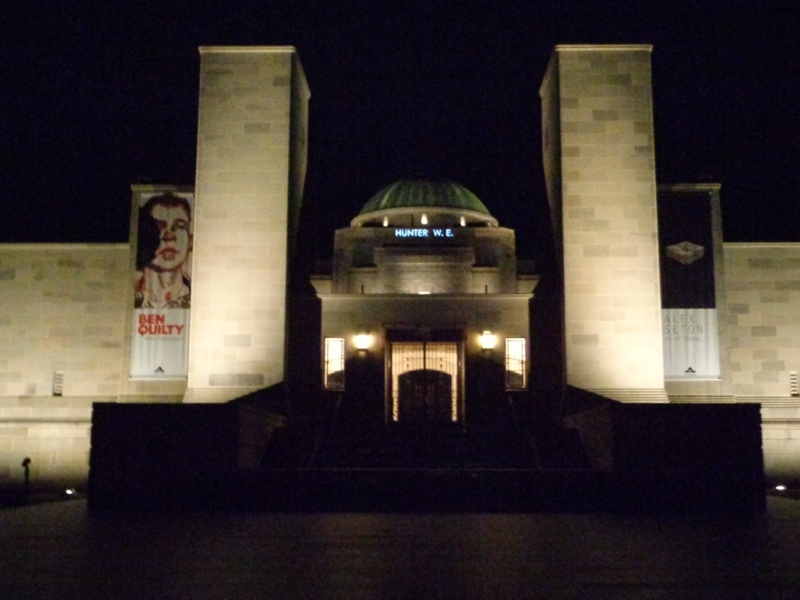 The Australian War Memorial during the 2014-2018 centenary period is at night projecting the names of each of the 62,000 Australians who gave their lives during the Great War on the wall of the Hall of Memory, about 30 times over these four years. 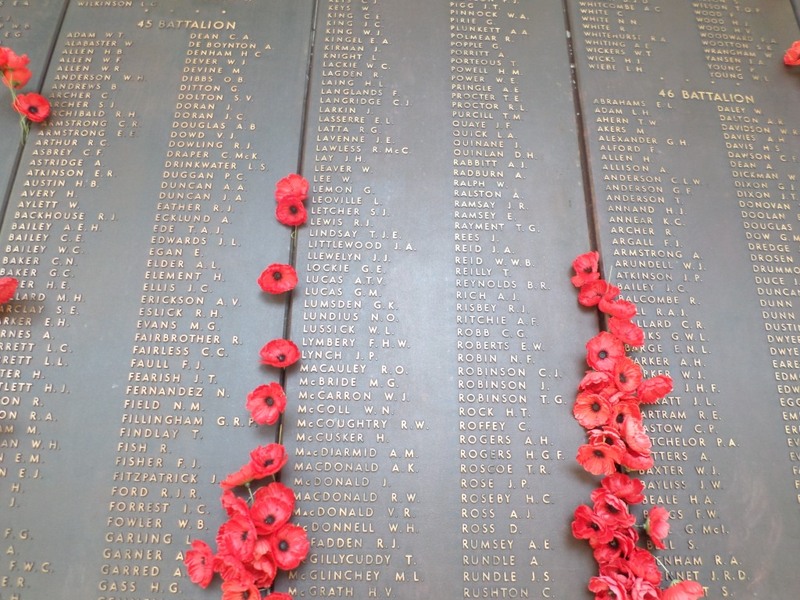 The names are visible for 30 seconds, and people can search the Roll of Honour database on the Australian War Memorial website to see when a particular name is planned to be projected. In the early hours of Monday morning we visited the Australian War Memorial to view the Roll of Honour name projections for two of the fallen Coo-ees – Rowland John Wilson at 1.52 a.m., and William Emerton Hunter at 2.44 a.m. We saw only a mob of kangaroos near the entrance gate, a rabbit on the lawns, a friendly black cat who came up to us as we walked back to the car, and a lone security guard wandering around with a torch during our night time visit. On Monday morning we met with a curator in the Research Centre to view a photograph of the Coo-ees entering Dubbo in October 1915 that is listed on the Australian War Memorial catalogue (with no image of the photograph). It has apparently only quite recently been donated to the Australian War Memorial collection. I have not seen this particular photograph before so was very excited to see it. I have placed an order for a print copy of the photograph so I can have a closer look at it, and hopefully a digital image of the photograph will then be placed on the AWM catalogue.